Albert thought he was at least a competent teacher before he moved to the Angel; competent, if not dedicated, for he knew he was by vocation an architect and only by economic accident a teacher. Most of the schools to which he now went as a relief teacher were very different from those he had known previously: bad housing conditions, several different immigrant groups, and indifferent teachers combined to bring some schools close to an anarchy in which Albert felt ineffectual and out of place. And then there was Jenny: Albert's failure, years before, to gain her love preoccupied him for a large part of every day, and somehow she was involved in his mind with both his failure as a teacher and his failure to fulfil himself as an architect. 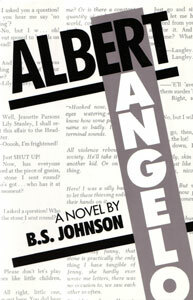 In this, his second novel, B.S. Johnson is here reacting against and successfully going beyond the arbitrary conventional limits of the novel form, and using language with great intelligence, precision and virtuousity. The result is exhilirating and disturbing, funny and deeply serious, moving and shocking, and, above all, honest.